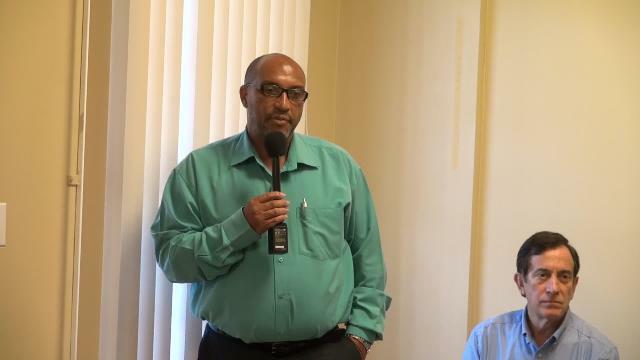 NIA CHARLESTOWN NEVIS (OCTOBER 12, 2016) — The Aerial Unit and truck operators at the Nevis Electricity Company Limited (NEVLEC), will be better equipped to handle their tasks when they complete a five-day practical and theory training session on Basic Hydraulics. The opening ceremony to herald the start of the course, took place at NEVLEC’s board room at Long Point Road on October 11, 2016. Ian Ward, Manager of the company’s Transmission and Dissemination Department chaired the ceremony and described the training as a demonstration of NEVLEC’s attitude towards development and training for all its staff. He said, in this case, management saw the need for specialised training with their hydraulic vehicles – bucket trucks crane trucks and digger derricks and invited an expert in Altec International equipment to conduct the training. “We believe in you as members of the NEVLEC staff and we are confident that with the additional training…you would surpass the excellent standard you already set at the power station,” he said. Carlo Simone of Argo America and facilitator for the workshop, worked with Altec International as its Chief Mechanical Engineer for 20 years. He said Altec is known to manufacture the finest equipment in the world but the quality of operating and servicing their products is critical to their performance. “We need to make sure how to use it, how to maintain it and how to inspect it. That it is operated effectively and safely. So the course will review inspection of the truck for it to work. Review the best practices on how to operate the equipment. “Altec does not teach how to work on hot lines but we will certainly try to review the operation of the equipment, care, preventative maintenance, corrective maintenance, troubleshooting or any information you would wish to know about the equipment,” he said. Jervan Swanton, NEVLEC’s Acting Manager, said the training follows recent training for their linesmen. The training he said, was also intended to make the staff feel a part of the company apart from gaining knowledge that would enable them to carry out their functions efficiently. He urged the participants to be attentive and to engage the facilitator as much as they could. Meantime, Chairman of the NEVLEC Board of Directors Farrell Smthen, told the participants that they should see the training as an investment, not only in the company but also in their personal development. He expressed hope that the results of the training would soon be reflected in their duties. Minister responsible for Public Utilities Hon. Alexis Jeffers who was also present, called on the participants to take advantage of the training. He told them it is meant to increase their capacity, embrace new technologies, increase efficiency, to become more company oriented and to ensure longevity within the company.